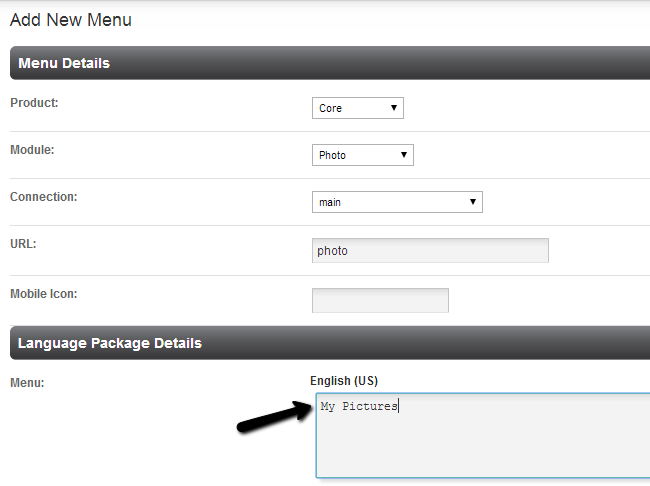 All of the menus on your PHPFox website are pre-defined within the CMS section. For example, the main user menu, which is used for reviewing your homepage, friends, photos, etc. is such a menu and all of it’s options are predefined. You can edit them as per your needs or add new menu items to them. Select the CMS tab from the main menu and then Menus > Manage Menus. Choose the menu item that you wish to change and click on the Edit button next to it. Change the actual options that you wish to edit. For the purpose of this tutorial, we have changed the Photos name to My Pictures.